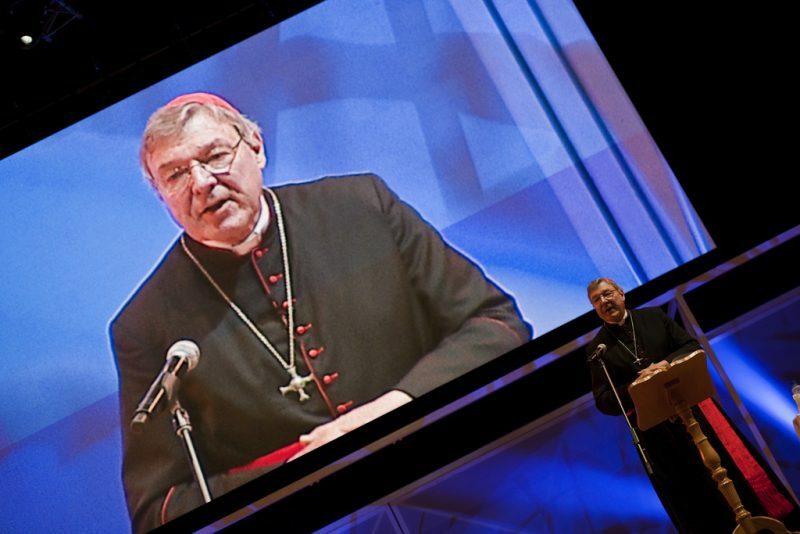 Mass given by Cardinal George Pell at World Youth Day Madrid 2011. Image courtesy of Catholic Church England and Wales Flickr account (CC BY-NC-SA 2.0). Australian Cardinal George Pell, the Vatican’s third-highest ranking official, was convicted of sexual assault by a Victoria court on December 12, 2018. But Australian media aren’t reporting on the trial or its outcome. Despite Pell’s mammoth status in the Catholic church and as a public figure, his trial has been held in secret, following a Victorian County Court suppression order that applies Australia-wide. It was imposed after the court accepted that knowledge of the accused’s identity in the first trial might prejudice a further trial being held in March. The prosecution sought the original suppression order in May 2018 “to prevent a real and substantial risk of prejudice to the proper administration of justice.” It is not uncommon for suppression orders to apply to separate trials if news of the first may affect the following proceedings. Journalists may face prison terms for breaching a court suppression order, and prosecutions may even extend to new media. Despite the order, news of the verdict has gotten out. The Daily Beast was first to cover the story, followed by the Jesuit magazine, America Media. US-based independent Catholic News Agency ran with the story, but then blocked access for readers located in Australia. Traditional media were slow to take up the issue despite taunts on social media. A number of not-so-subtle front-page newspaper articles addressed the trial, but did not reveal the verdict itself. In a piece subtitled “Why you can’t read what you may want to,” The Guardian explained that suppression orders are often imposed to protect witnesses, guarantee a fair trial or in the interest of national security. “They can be wide-ranging, clamping down on nearly all – and at times all – information about a trial, or narrow, obscuring just one person’s name,” the article notes. In this case, the order is relatively broad. While the order could have been limited so as to protect only the identities of private citizens affected by the case, and/or the court proceedings, it instead applied more broadly. Secrecy surrounding the verdict has since dominated Australian social media, with George Pell’s name rising to the top of Twitter trends in Australia and Wikipedians updating George Pell’s article to reflect the verdict. If anything, the suppression order has elevated public knowledge about the case online. There are days to be warriors against press censorship. Today is not that day. The suppression order is not censorship – it’s there to protect the ongoing court process, & prevent defense lawyers from crying foul. It’s not about us. The suppression order that has reportedly been made in relation to a high-profile Victorian court case applies to everyone, not just media companies and journalists. If you share links to overseas media reports you are potentially in contempt of court. Don’t do it. L was concerned that where truth is absent, lies will fill the void. Steven Spaner, Australia coordinator from the Survivors Network of Those Abused by Priests told the Daily Beast he felt frustrated and left “in the dark” because of the suppression of news about Pell. Your piece conflates the court suppression order with the church’s coverup of sexual abuse. This is absolutely incorrect. The suppression order was issued to protect the integrity of other pending cases, not to cover up abuse. Suppression orders have become increasingly contentious in Australia for a number of reasons. There have been concerns that they are overused, prompting the Victorian government to pursue an overhaul of relevant legislation to “reinforce the presumption in favour of open justice and the disclosure of information in Victorian courts”. The rules are now clearly a farce. They are overly paternalistic and the public does have a right to know. But people also have a right to a fair trial and the media can and does trample on the process. I would hate to think that media reporting on this case meant the next trial could not proceed because it’s impossible to find an untainted jury. This could leave the courts in a no-win situation in their efforts to protect the rights of both the accused and victims by ensuring a fair trial. The cardinal is currently on leave from his position in charge of the Vatican’s Secretariat for the Economy while he faces these and other charges. In a related development, Pope Francis has removed Pell from his Council of Cardinal Advisors. The decision was apparently taken before the jury’s verdict.